Did you know you can save $2,000 on a home automation system by installing the system yourself rather than getting it professionally installed? Wemo has an easy DIY setup and is much less expensive than professionally installed home automation systems. You can use that $2,000 to rig your home with Wemo home automation devices and have some money left over (depending on how big your home is). Read our Belkin Wemo review to see if this company has all the features you want in a home automation provider. Belkin’s Wemo line of home automation products includes light switches, lightbulbs, smart plugs, cameras, and more. All Wemo devices can be controlled remotely through your smartphone or tablet. Most home automation systems require a hub to connect the entire system, but Wemo doesn’t. Instead, Wemo uses your Wi-Fi network to connect each device together and let you control what the devices do through Wemo’s app. One question many users have is what the difference is between these four technologies. Z-Wave, Zigbee, and Insteon are all forms of wireless home automation protocols that operate independently of Wi-Fi frequencies. Wemo is not a protocol like the others. 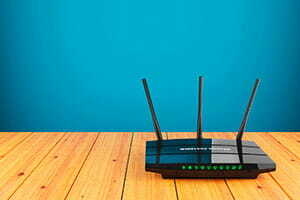 Instead, it’s a technology that uses your home’s existing Wi-Fi network to allow all connected devices to communicate with each other. That means that unlike Z-Wave or Zigbee-enabled systems, Wemo requires Wi-Fi to be enabled at all times for it to work. Unlike with many home automation companies, you do not need a hub to use Wemo. However, if you already have one of these hubs listed below you can integrate Wemo devices with it. Wemo’s key integration system is through IFTTT (If This Then That). IFTTT is a free web-based service that lets you create series of preset device commands called recipes. For example, you can set the lights to turn on at sundown, get a ping on your smartphone when the cat’s litter box is full, or switch your Crock Pot to its warm setting when your food’s ready. Customers rave about Wemo’s IFTTT integration because there are so many possible recipes. Amazon’s Alexa works with Wemo’s Switch, Insight Switch, Light Switch, Dimmer, and Plug. You can use your voice to enable or disable the devices—all you need are the Alexa and Wemo mobile apps. 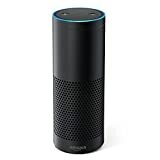 Unfortunately, the NetCams and LED Lighting Starter Set are not compatible with Amazon Echo, but if you plan on using only the devices listed above and already have Alexa, then this may be a good option for you. Apple HomeKit is an app that connects home automation devices, and it’s compatible with only iOS devices. In order to use Wemo products with HomeKit, you must purchase the Wemo Bridge for HomeKit, which isn’t set to ship until fall 2017. The Bridge connects to your router via Ethernet and integrates with iPhones, iPads, and Apple Watches. Similar to Amazon’s Alexa, you can use Google Home to control some Wemo devices including the Dimmer, Mini Smart Plug, Insight Smart Plug, Light Switch, and Switch Smart Plug. Unfortunately, you can’t use the NetCams or LED Lighting Starter Set with Google Home, but it can be pretty convenient if your hands are full and you need a light or appliance to turn on or off. Neither Nest nor Wemo has a hub, but they are able to connect to one another through IFTTT. Nest works with Wemo’s Dimmer, Mini Smart Plug, Insight Smart Plug, and Light Switch. Nest is able to detect if you’re home or away and communicates that to your Wemo devices so they turn on or off. You can also adjust the Nest Thermostat directly through the Wemo app. If you already own a Samsung SmartThings hub, you can connect some Wemo devices to it. The SmartThings hub can control Wemo’s LED Bulb, Switch Smart Plug, and Light Switch. You can continue using your SmartThings app to control these devices instead of downloading the Wemo app separately. Below are some of the equipment options Wemo offers. Keep in mind that when you choose Wemo you don’t need a hub, so the device you purchase won’t need anything else besides the free Wemo app and an internet connection to use it. 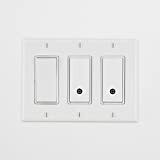 The Wemo Wi-Fi Smart Dimmer connects to any traditional dimmer switch to let you control the ambience of a room with your smartphone. It can be used in the living room when you have a movie night or in the dining room if you want softer lighting. The Dimmer’s Night Mode turns the lights on to a lower level during specific times, like if you get up to go to the bathroom in the middle of the night. If you purchase the Dimmer and a Smart Plug you can set up an IFTTT recipe so if the lights dim, the Smart Plug with a lamp plugged into it will turn the lamp off. 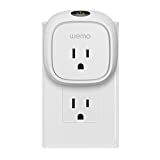 Anything a traditional light switch can control, the Wemo Wi-Fi Smart Light Switch can handle, including ceiling fans, chandeliers, recessed lights, and more. This device is a great option if you have kids who like to leave their bedroom lights on. You can set all the lights in your home to turn off at sunrise so you don’t waste electricity. If you’re a sports fan, you’ll want to take advantage of the IFTTT recipe to blink the lights when your favorite team starts a game. This smart plug is perfect for electronic devices like fans, coffee makers, and lamps. Best of all, the Mini Smart Plug doesn’t block adjacent outlets like bulkier smart plugs. 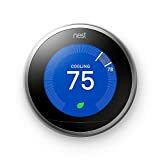 You can set a schedule for whatever device you plug in—for example, if you have a Nest Thermostat and a fan plugged into the Mini Smart Plug, Nest can tell the plug when the room is cool enough so the fan turns off automatically. It also has a cool Away Mode, which will turn plugged-in lights on and off periodically to make it look like someone is home. If you use Wemo Bulbs, you can use IFTTT to set the Smart Plug to turn off at the same time as the bulbs. The Wemo Switch Smart Plug is the Wemo Mini Smart Plug’s predecessor. The two smart plugs do the same job—the only differences are the look and size of each device. This plug is bulkier than the mini, so you can’t use two of them in one outlet. We recommend purchasing the Wemo Mini Smart Plug over the Wemo Switch Smart Plug because of the design difference. The Wemo Insight Smart Plug does everything the Wemo Mini Smart Plug does, but it also tells you, in real time, how much energy a device is consuming. That way, you can keep a closer watch on your energy bill as well as your carbon footprint. 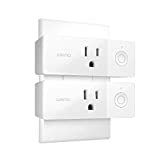 An IFTTT recipe you could use for this would be to set the Insight Smart Plug to turn off after it incurs more than $3.00 of energy costs in a day. The NetCam is a good video surveillance option if you want to add some security to your automation. You can stream live 720p HD video and see clearly thanks to the wide-angle glass lens and night vision. It also sends notifications to your smartphone when it senses motion. If you want to store videos in the Cloud, you’ll have to pay for the Cloud+ Premium subscription, which is $9.99 per month or $99.99 per year. To use this camera in conjunction with your Wemo lights, you could have the lights turn on if motion is detected after sunset. Additionally, you could use IFTTT to create a recipe to receive a phone call if motion is detected during certain times of the day, like when you’re at work. This NetCam is a step below the version above since it does not record in HD and it doesn’t have a glass lens. Other than that, it has all of the same capabilities. 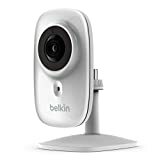 If you plan on using this camera to check in on your kids when they get home or your pets while you’re away, this is a great option. You could create an IFTTT recipe to text you when the camera detects motion, letting you make sure your kids get home from school safely. 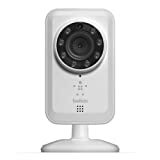 If you want to use the camera for home security, we’d recommend upgrading to the HD version with the glass lens because the footage will be clearer. One way to use it in conjunction with the Switch is to have your coffee pot plugged into the Switch and have it turn on if motion is detected by the camera. That way, your coffee starts brewing the moment you step in front of the camera. What do customers think of Wemo devices? What Wemo users rave about the most is the ability to use IFTTT recipes to customize their devices to fit their needs. Some customers experience app issues, but Belkin is good about responding to customer complaints. If you run into any issues, Belkin will likely be quick to help you out. 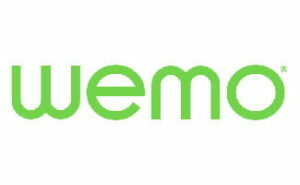 We recommend reaching out to Belkin on its website if you experience any issues with a Wemo device. Wemo offers multiple equipment options to get the job done so you can customize how your home’s automation works. Since there’s no hub required for Wemo, there’s one less piece of equipment you have to purchase. You can spend that extra money on automating your home further. Does Wemo have everything you’re looking for in home automation or is it missing something?